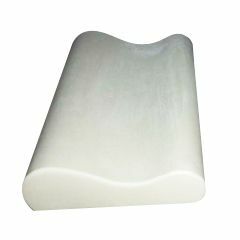 The Visco Memory Foam Pillow was manufactured with a molding process. this high density orthopedic pillow provides the ultimate stress-relief while it also prevents and reduces neck pain. We supply the pillow to Chiropractors, Physical Therapists, and Pharmacies. Temperature-sensitive foam interacts with body heat to gently mold to your shape and provides customized comfort. Dimensions:20" x 12" x 4"
No. There are huge differences in quality in regards to memory foam pillows. Durability is another important quality aspect in memory foam pillows. Due to manufacturing differences, some foams lose their “slow recovery property over a short period of time while high quality foams never lose their resiliency. Quality Material, smaller than expected. I use this pillow because I have Spondylitis, (Arthritis of the spine and joints that can attack young people) and I need to encourage myself to sleep on my back. It works as advertised and the foam is very dense and supportive. The only drawback I feel, is that compared to the other foam cervical pillows I've seen in stores it is quite a bit smaller. Even though your head does not need that much space, there is something soothing about the large memory foam indented pillows compared to this one. I am not going to replace it... it does the job. For some the size could be an advantage if you are travelling or share a bed. This is very good for neck protection. I do not recommend this product. The high density was too hard. I purchased it thinking the higher the density the longer it would last since I had another memory foam pillow that provided great support but just didn't hold up after 1 year. I had to see the chiroprator more after using this pillow [...] Deffinately don't plan on doing business on this website again. I suffer from degenerative disc disease and need to find a cervical pillow, per my chiropractor, for neck pain relief. I've purchased several memory foam cervical pillows, but they have all been too big for my body frame. I require a size small and wondered if this pillow would be considered a "small?" I don't want to add ANOTHER pillow to my collection. Any recommendations?